how are you guys? I am very sorry for the long time not posting, but I am really so busy this days, anyways, let us head to the point. I have got a new book for iPhone development, I have started reading some articles about it and I really like it very much, it worth the effort. 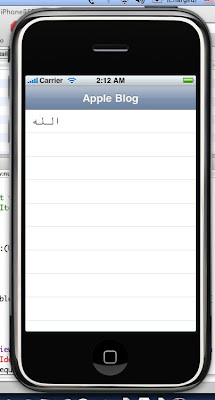 The first thing came to my mind is to show Arabic strings to the screen of the emulator, and the shock was that iPhone doesn't support Arabic, for me I started to work on the emulator and XCode until I finally did it, now I am able to show Arabic in my application on the iPhone, for me it is very important as there is a lot of development will be done on such device and of course it will need Arabic, Here is snap shoot for the emulator after writing the word ALLAH. Thanks to ALLAH that I did, it was nice try and I learn a lot to just show this word on the emulator. I hope that I can do something useful to my Arabian bothers and sisters, this is just a step, I will work to get deeper into the system and provide you with open source solution to support Arabic on this magnificent device. I really respect and appreciate your persistence in supporting Arabic in all new platforms and frameworks. It's really rare to find an Arabian developer care about it. It's really such a shame when seeing Arabic language to be supported by non-arabian or even Israeli developers! Great work, Ahmed! Keep going. People in Egypt work hard to have good life, there is no time to have some fun because u spent your day at office and pretty good time in the amazing Egyptian traffic. People in Gulf care about technology they pay a lot for technology but they never used it to the end, they keep update while they never used half of what they have got. so there is very low number who can do anything for the community or for believes, it is time consuming and effort consuming to do something that is out of your career scope, but we do something that is may be used by someone else tomorrow. Great work Ahmed. So as I see it, it's application specific, not global for all iPhone applications. Have you seen the guys at http://www.iphoneislam.com/? they've Arabized the iPhone long time ago, but only jailbroken iPhones. I think their work might help you. I saw it but actually I don't like it because as you said that it is for Jail Broken Devices, what I am thinking about is doing something that fit with the system original state. I mean Break Jail the device cause many problem first of it, that it is open for anyone to do application that steal your data, which in many cases is not accepted, I have done the first step which is discovering many parts and the ability to do Arabic for iPhone, I think the OS X will help a lot in adding Arabic Support legally. There is too much work to do for this issue, also if I could give it for free, also I figured out a way to localize the system with less performance consumption almost like the Arabic support is not working on the background. Nice Job Ahmed ;) . First of all, you have to know that Mac OS X has unix kernel this is since Mac OS X was named NeXTStep. so some how what is on Mac OS may be found on some other Linux versions as long as it doesn't depend on the Frameworks that is showed up by Apple lately, so u can understand from that you can us some linux code and recompile it for Mac OS X and it will work, anyways this is not an issue, I just mentioned that for clarification. There is anther method instead of using the current XCode and Mac OS X Stuff, the other method is simple but it will be tough,because there is no helper tools as you have in XCode, for example there is no debugger, you can get a debugger, but it is tough operation to make it up and running, anyways you can use some Linux distributions, it is mentioned in details in book named "Open Application Development, Write Native iPhone Applications" , this book has all what you need to start iPhone development without need to any Mac OS X stuff but as I mentioned there is no emulator or debugger or anything, u r on your own, which means if you don't have iPhone device, it will be some kind of impossible to do anything with it, you may do something but it will be like writing code that is just compile. I hope that I did clear things to you, and I hope that my reply was useful :) thanks for your time. This is really interesting ... I wanna join you. thnx man ur gr8, but where is the program ? I hope that I have some time to be able to achieve what I want to do. Thanks for your replies and your time. What is the name of this book ?